This calculator will calculate the size of the monthly payment you will need to make to pay off your credit card balance within the desired time frame. Plus, the calculator will also show you how much time and money you will save by increasing your monthly payment beyond the prescribed minimum payment amount. 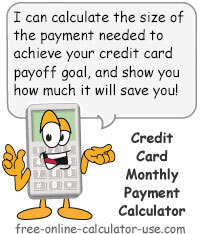 And, unlike most credit card calculators, this calculator will also calculate how many hours you will need to allocate to working to pay the interest charges on the credit card -- for both the minimum payment and the payoff goal payment. If you would like to see how much time and money you can save simply by "Fixing" your current monthly minimum payment, please visit the Credit Card Fixed Payment Calculator. Calculate the monthly payment needed to pay off a credit card within your desired time frame, and see how much money you will save if you succeed. Enter the current balance on your credit card. Enter as a dollar amount, but without the dollar sign and any commas. If you have added any new charges to your card since your last statement, be sure to include those as well. Enter the annual interest rate you are being charged on the credit card. Enter as a percentage, but without the percent sign (for .1799 or 17.99%, enter 17.99). Enter the minimum payment amount for the current month. Enter as a dollar amount, but without the dollar sign and any commas. Enter the lowest allowable minimum payment dollar amount. Enter as a dollar amount, but without the dollar sign and any commas. For example, if your credit card company states your payment will be 2% of the balance, or $15, whichever is greater, enter 15 in the field provided. Enter the number of months in which you would like to pay off this credit card. If you want to compare how many hours you will need to allocate to work just to pay the interest charges on your credit card, enter your real hourly wage in the field provided. Enter as a dollar amount, but without the dollar sign and any commas. Otherwise leave blank. Note: If you tap on the link, the Real Hourly Wage Calculator will open in a new window. This is how much you will need to pay each month in order to pay off the balance of this credit card within the number of months you specified. That is, assuming you that you never allow any new charges to carry over to the next month (increase the balance owed). This row shows the number of payments and the total interest cost if you make only the declining minimum monthly payments on your credit card. If you included your real hourly wage in your entries the calculator will also show you how many hours you will need to work to pay the interest charges when making only the minimum monthly payments. This row shows the number of payments and the total interest cost if you pay off your credit card within the number of months you specified. If you included your real hourly wage in your entries the calculator will also show you how many hours you will need to work to pay the interest charges if you pay off the card within the number of months you specified. This row shows the month and interest savings you will realize if you make the new payoff goal payment instead of making declining minimum monthly payments. If you included your real hourly wage in your entries the calculator will also show you how many work hours you will save if you pay off the card within the number of months you specified. Enter the current balance owed on the credit card. Enter the annual percentage rate being charged by the card company. Enter the current monthly minimum payment amount. Enter the smallest payment allowed by the card company. Enter the number of months to pay off the card. If you want to be alerted to how many hours you will need to work to pay just the finance charges, enter your real hourly wage (after taxes and work-related expenses). Tap the "Calculate CC Payment" button and scroll down to view the results. Are you voting to put credit card companies in charge of our country? Whether you realize it or not, the vote you cast in the voting booth is not your primary method of voting for how our country is run. Instead, your primary and most influential method of voting is how and where you invest and spend your money. Think about it. Who can afford to hire the best lobbyists and lawyers money can buy? And how do businesses become big businesses? That's right, you, me, and a host of others spend money to purchase their goods and pay for their services. When you carry a balance on a credit card and allow yourself to be duped into making only the minimum monthly payments, not only are you throwing a significant chunk of your potential future wealth out the window, but you are also continuously casting votes in favor of allowing credit card companies to have a major influence over how our country is run. Considering credit card companies are continually preying on college students and working families for profit, is that really who you want running our country? If not, then I sincerely encourage you to stop casting votes for them.